WINDHOEK – Namibia has finally signed the trillion-dollar African Continental Free Trade Agreement (AfCFTA), which requires members to remove tariffs from 90 percent of goods to allow free access to commodities, goods and services across the continent. President Hage Geingob signed the much-anticipated trade agreement on Sunday during the Heads of State and Government of the African Union (AU) meeting at the 31st Ordinary Session of the Assembly held from July 1-2, in Nouakchott, Mauritania. Inking the deal showcases Namibia’s shift from a protectionist stance, celebrated by particularly local manufacturers but heavily criticised by protagonists of trade liberalisation who believe the removal or reduction of tariff obstacles would boost trade and jobs.It is not clear at this stage how this agreement would affect Namibia’s infant industry protection ambitions. The core of the argument is that nascent industries often do not have the economies of scale that their competitors, often foreign, may have, and thus need to be protected until they can attain similar economies of scale. Neighbours South Africa, from which Namibia procures 80 percent of its imports, also signed the agreement last weekend. 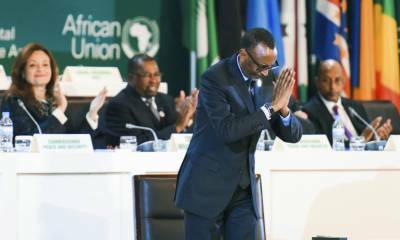 South Africa initially declined to sign at the special summit in Kigali in March, where 44 out of the 55 AU member states signed. South Africa needed to run the agreement by law advisers first, and will now take the agreement to be ratified in the SA parliament. Here are the key objectives of the African Continental Free Trade Area (AfCFTA) agreement. • Create a single continental market for goods and services, with free movement of business persons and investments, which will pave the way for accelerating and establishment of the Continental Customs Union and the African Customs Union. • Enhance competitiveness at the industry and enterprise level through exploiting opportunities for scale production, continental market access and better reallocation of resources. • Expand intra African trade through better harmonization and coordination of trade liberalization, facilitation regimes and instruments across Regional Economic Communities (RECs) and across Africa in general. • Resolve the challenges of multiple and overlapping memberships and expedite the regional and continental integration processes. The United Nations Economic Commission for Africa estimates that the agreement would boost intra-African trade by 52 percent by 2022. The proposal will come into force after ratification by 22 of the signatory states. In Namibia, Geingob is now expected to take the agreement to Cabinet before trade minister Tjekero Tweya tables it in the National Assembly for its adoption and ratification. Besides Namibia and South Africa – Sierra Leone, Lesotho and Burundi also signed the agreement on Sunday, but Nigerian foreign minister Geoffrey Onyeama told Daily Maverick his country needed to finish its internal consultation process first before committing to anything. This means South Africa is the biggest economy to have signed the agreement so far.